Most of Android users who have a taste for music and smartphones have been playing audio formats since the birth of the Android OS. 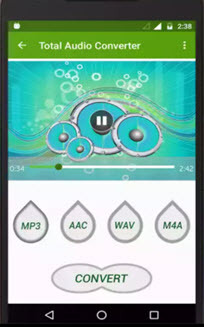 Most of the phones support the MP3 audio format and play them with built-in music players and sometimes downloaded .apk files from the Google Play store or from browsers. However, most of the smartphones of versions older than 4.0 don’t support AAC format with their built-in music player. To overcome this problem you can install third party music players or you can simply convert AAC to MP3 format on Android. a third party uncertified apps not only slow down your phone but also may infect them with viruses. Then go for option number two: convert the AAC to MP3 for your Android device. Below we're gonna outline Top 10 AAC to MP3 Converter Apps for Android devices. 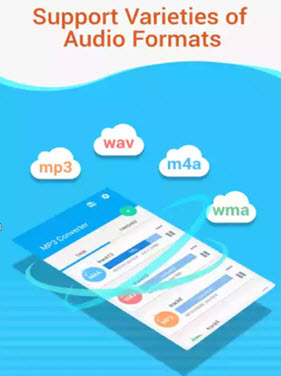 Before the AAC to MP3 converters for Android, we would like to recommend iSkysoft Video Converter Ultimate as an ultimate all in one converting solution for video and audios. It is a stand-alone tool including featured functions like convert between 150+ video and audio formats, download and edit before converting, play and manage all your videos and more. You can easily convert any video or audio you want on your Mac or Windows and then sync them to your mobile devices even game consoles and TV in seconds! 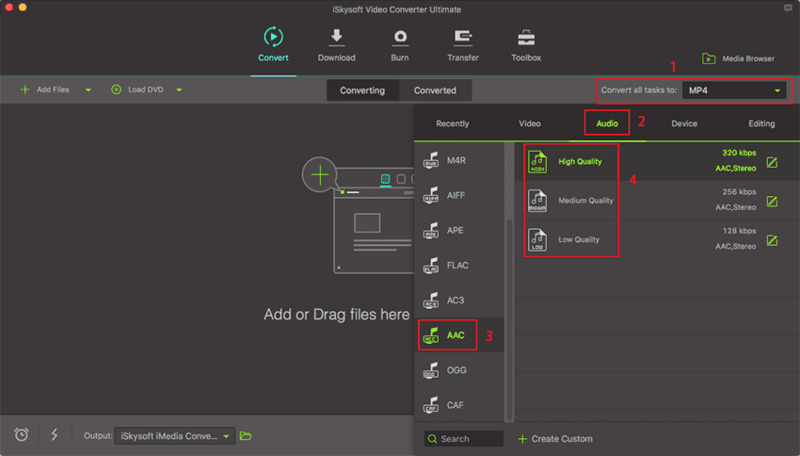 Audio and video converter software which also allows you to perform all sorts of video and audio-related operations in just one platform only. Support most of the audio formats known to conduct audio conversion not only for AAC to MP3 but also for WMA, WAV, M4A, OGG, AC3, etc. Convert standard video formats, HD video formats, online video such as YouTube, even DRM video formats directly to your Android and iOS devices. Inbuilt editing tools like crop, cut, rotate, add effects, watermark and subtitles to your target videos before converting. 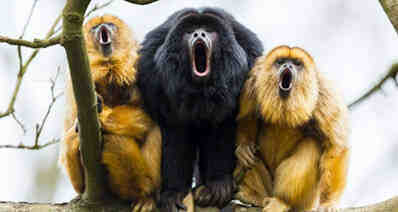 Download or record videos from more than 10,000 online video sharing sites, such as YouTube, Netflix, Vimeo, Hulu, etc. 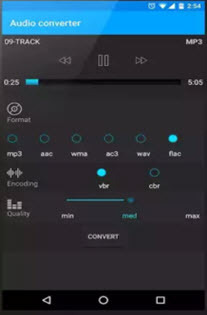 It is a simple App supporting Basic Audio Conversion processes. It supports MP3, AAC, M4A, and WAV. It has been downloaded over 100000+ times. It is rated 3.1 out of 5. It is a C grade App. A lot of Ads Appear in it. MP3 Converter is a good application to convert audio files to other formats. It has a Mp3 cutter for editing audio files. It can convert video files to audio formats too. It has MP3 Cutter for editing Audio files. It is embedded with an FFmpeg powered video cutter. It supports almost all popular video formats. It has to rate of 4.4 out of 5. It has too many Ads. Phone slows down due to Ads. It is just a simple audio converter used to convert known audio formats to other formats. Its latest 1.1 version is available in which bugs are fixed. 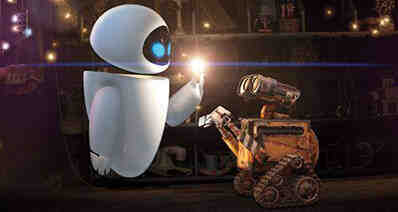 It is of very small size i.e. 4.05 MB. It is fully customizable converter in three rates such as Audio Bit Rates, Sampling Rates and Number of channels. It does not require an internet connection. It supports very fewer formats. It is rated 3.4 out of 5. Sometimes it does not detect files. 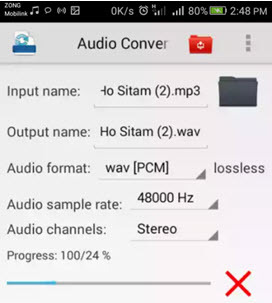 Its description says it is an audio converter for MP3 and AAC. It has a size of 6.92 MB. It has been downloaded over 100000+ times. It is of small size. It supports basic formats MP3 and AAC. It just converts videos to MP3 and AAC. It has rating of 3.6 out of 5. It contains a lot of Ads. It is an audio converter, editor and trimmer. It can also mix and merge audio tracks. So, it provides a user-friendly atmosphere. It supports majority of formats. It is rated 4.5 out of 5. It can support long length audio formats. Ad free version is $0.99. 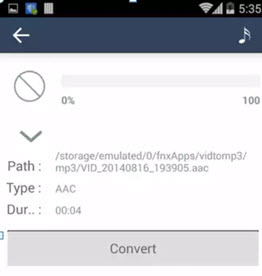 MP3 Audio Converter is a simple App which performs some basic conversions. MP3 Audio Converter supports Mp3, AAC, WAV, WV, OGG and FLAC. It supports audio sampling up to 192 KHZ. It supports mono and stereo channels. It has rating of 3.2 out of 5. It supports MP3, WMA, OGG, AAC, AC3, and WAV. It has a material design user interface with fast converting speed. It can do batch processing also. It has rating of 4.0 out of 5. It has a maximum bitrate of 256 Kb/s. It supports all ARMs (Processors). It has a lot of Ads. Phones with low RAMs usually hang. 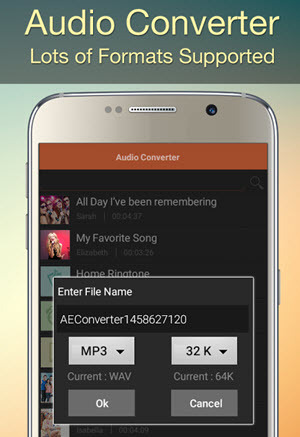 It is an enhanced Audio Converter App which can convert audio and video formats to audio formats. It has a variety of known audio formats and it is popular on Google Play Store. It has rating of 4.4 out of 5. It is fast and time-saving. It can convert videos to audio too. It supports most of the popular audio formats. 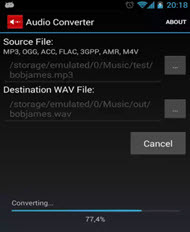 The audio Converter allows you to convert audio files using standard Android codecs. It has a MP3 cutter for editing the audio file. It supports basic audio formats. Its video cutter is powered by FFmpeg. It is rated 3.3 out of 5. A lot of Ads appear. 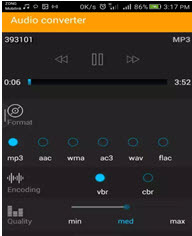 It can convert videos and audio on your Android Phone and supports audio formats like M4A, AAC, FLAC, OGG, WAV and MP3. It has a video editor. It can edit audios bitrate and sample rate. Unable to upload files from SD card.